Also on the panel is Lisa Regula Meyer from Ohio (in the picture with her husband and son, and one set of fathers she helped), a mother of one and also a nearly graduated biology doctoral student. “Having never really planned to be a parent until I unexpectedly became pregnant almost seven years ago, I nevertheless ended up helping to create 4 families through egg donation, and both gestational and traditional surrogacy,” said Lisa. 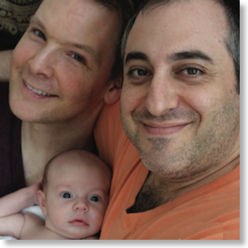 The parents Lisa helped are two gay couples, one from Massachusetts, and one form upstate NY. Her own son was born in 2005, and parenting was a truly life changing experience. After a year, and still determined not to have another child of her own, she began to explore surrogacy. 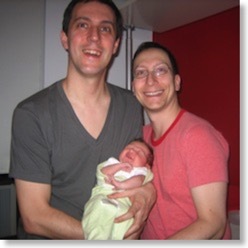 “I grew up with discussion of surrogacy, as my mother very much enjoyed pregnancy and had easy births.” After researching and finding an agency, two embryos from her IFs in the Boston area were transferred, resulting in a healthy a little girl born in July of 2008. 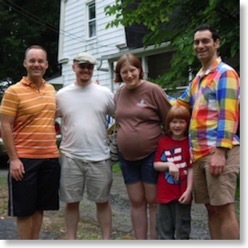 After this experience Lisa found herself eager to help create families. No ready for another pregnancy immediately, she decided to pursue egg donation. She donated eggs to two couples, both of which resulted in healthy boys (one in 2008, the other in 2009), and one couple later using the frozen embryo to have another healthy boy in July, 2012. “While both egg donations were anonymous, in late 2011 my first egg donation recipients asked to learn a little more, and that egg donation has since become a known donation,” said Lisa. You can read more form Lisa at her personal blog, at The Next Family, and several other venues.